Since Kodak released the first consumer camera, they have promoted the use of the Golden Rule of Thirds to improve amateur photography, thereby selling more film. Millions of novices took to the streets with their newest compact cameras and shot to their hearts content, only to realize that they either had no taste in composition or that there was still a huge difference between their attempts compared to that of professionals. What most would be photographers didn’t realize was that professionals didn’t use the Golden Rule, but instead used the Golden Mean or the Golden Ratio. The main reason for this difference was due to the complexity involved that amateurs had no passion to learn. The professionals on the other hand were now competing with a slew of amateurs and needed to distinguish their work through excellent composition. Kodak promoted the Golden Rule because it was fast and easy to learn, especially on a camera using a 4:3 format ratio. The Photographer looks through the viewfinder, imagines that it’s divided equally into 9 boxes (3 across and 3 down) and aligns the picture so the most important element is at one of the intersections. The Golden Mean is more difficult to understand and allows the photographer to use it with any format ratio. It is not only mathematical, but also very present in nature – The natural spire of a seashell, the rectangular layering of triangles perpendicular to each angle, or the rotated rectangles inside of rectangles. This divine composition mathematically works out to a 1:1. 618… ratio. Cinematographers choose the Golden Mean over the Rule of Thirds, but seldom have time during a shoot to address the math in order to frame and capture the perfect composition. Instead, they get a feel for what looks good by practicing the proper framing so often that their eye goes right to the Golden Mean points without any calculation. 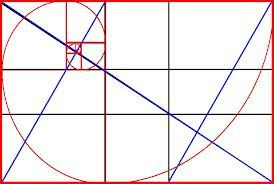 I was first taught the Golden Mean when I was shooting a documentary for CBS back in my early 20s. I struggled with the math until a more experienced pro took me under his wings and shared his secret to capturing the right composition on the fly. His trick was so easy and effective, that I won several awards for composition. I was also able to use the technique for still work and won prestigious composition awards from Kodak and Polaroid. 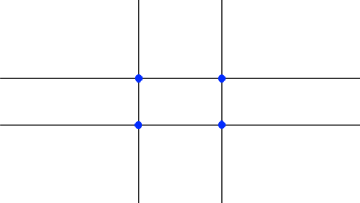 Instead of attempting the math, the pro told me to divide the screen by 5 units followed by 8 units, or 8 units followed by 5 units, both vertically and horizontally. This meant that the entire frame had 13 vertical units and 13 horizontal units. 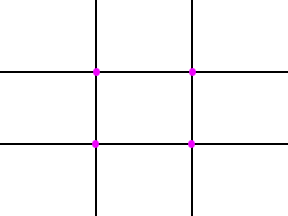 The place where the two ratios intersected was the golden composition point. This allowed me to memorize the placement of the composition points based on the size and shape of the frame. If I was shooting at 1:2.35, I could find the composition point just as fast as I did shooting at 1:1.85 or any other frame size. With this new form of composition, the sizing of the frame did not matter, nor did the perf pull down system. It no longer mattered if the frame was single perf, 4 perf or even 8 perf. This also meant it transitioned quickly to HD regardless of the sizes or dimensions of the digital censors or the 16X9 relative fields from RED, SONY, ARRI, etc.. The Director of Photography is always concerned about the format, lense, lights and composition. Each element helps capture the director’s vision onto the media of choice. And, because movies are pictures in motion, the other factor that concerns DPs is the camera movement. The good news is that the Golden Mean can quickly be reset during dolly, crane, or steadicam shots. A well-practiced camera movement that ties in with the actor’s blocking might have a series of focus changes and shifts in composition. Using the Golden Mean allows for the constant changing of the composition on the fly and looks great on screen. While watching the special features on Disney’s 20,000 Leagues Under the Sea a few years ago, I ran into an intriguing mention of complex composition guides for Panavision’s CinemaScope. Being something of a composition junky, I’d love to find the guides. Whatever they look like, Disney did a good job at hitting their marks. Beautiful cinematography.